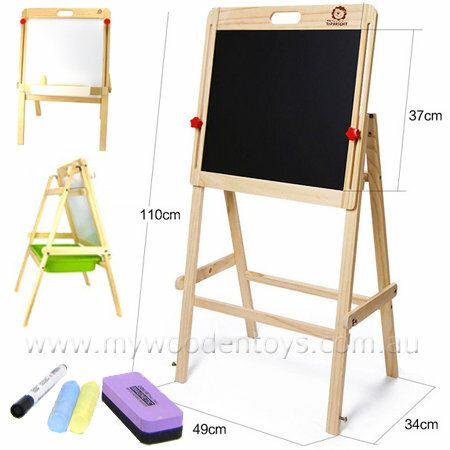 Wooden Blackboard Whiteboard Easel is a beautifully made high quality adjustable wooden easel with a blackboard on one side and a white board on the other. This Blackboard Easel comes with fat chalk, a whiteboard marker, duster a white plastic tray which attaches to the front and a green plastic tray which fits across the bottom to make tidying up easy. The Blackboard / Whiteboard is adjustable by undoing the red knobs on either side of the frame. It can be slid up and down to suit your child's height or removed for easy storage or transport. We like this because: "Very well thought out a great creative tool. "